The website was new with zero videos, zero signups. A totally new startup. Our challenge was to bring users, viewers towards this website. We did On-site SMO of the website first. In-content, social media features. E.g. Social widgets, sharing features such as RSS, social login, social comments promoting plugins, video and photo channel integration. We created 4 pseudo profiles. The client had contracted with some television channel. We uploaded videos using those 4 pseudo profiles. Optimized the content with tags, and rich snippets. Created a page for video portal on Twitter, YouTube, Facebook, Google+ and Vimeo. Since the 4 pseudo profile already had connections inbuilt, the page started gaining likes, fans, and votes. Initially we started promoting on Facebook ads and Google ads for increasing likes and votes. We then promoted the content across social networks (via fan pages, profile pages, etc. ), participation in other content networks, forums, brand news propagation etc. We created contests on social media networks for gaining snaps and video uploads. Announced prizes. Thus, started gaining traffic and signups for the video portal website. 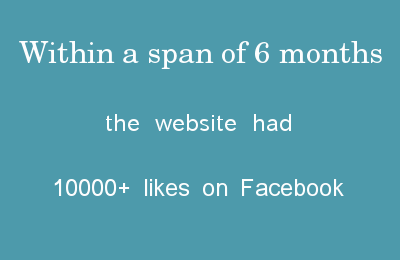 Within a span of 6 months the website had 10000+ likes on Facebook. More than 1000 genuine registrations on the website.